In the past many folks tuned their dulcimore to what is called 1-5-5. Balis Ritchie would tell you “Bim- bim- BOM”. We have reversed the strings to note the bass string as a “1”. Some continue and everything is described by roots, but I stop at the bass string as “1”. 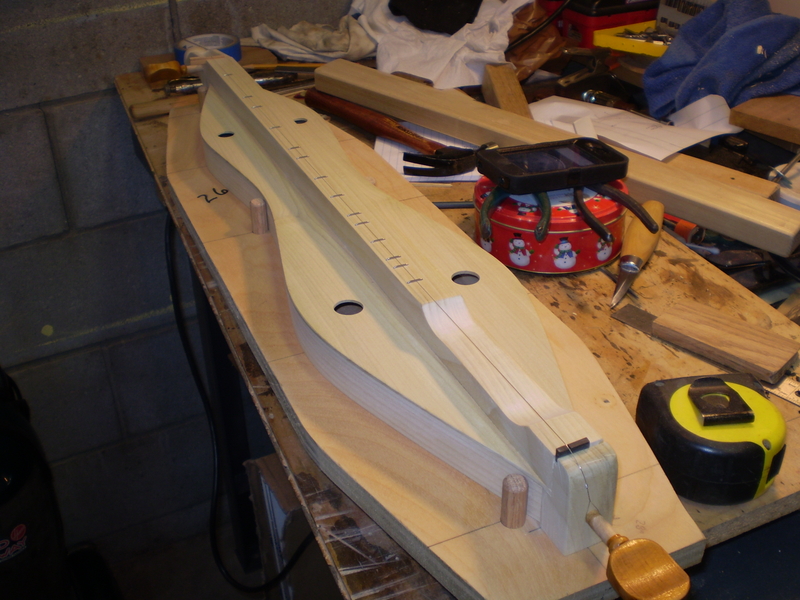 1-5-5 is in translation to the modern dulcimer DAA. The distant past didn’t tune as we do today, the dulcimore was tuned to itself. A comfortable tension on the bass drone and melody and middle drone was a fifth or octave above. (Around CGG) No need for a tuner, just pull it close by ear. Many instruments had the intonation set for 1-5-5. They were very high actions for noter play and do not sound very good tuned 1-5-8, or Dad. This is the reason many older instruments get a bad review when it is played “modern”. Even the dulcimore with seemingly impossibly high actions are quite easy to “wail” on with a noter and sound quite good once you find the “sweet” spot. So I’ve once again looked to the past for my next project. My dulcimore have mathematical formulas to set the fret patterns and this works quite well for modern intonations set at or about 1-5-8, but when slacking the melody string down to 5 from 8 it is a little much. The string flexes much easier over the frets and intonation is already out doubling the problem. I made a dulcimore complete without finish and staples. I used a 27 VSL because I hadn’t used that length before to differentiate it from the rest. On the first lay out I got eleven of the fourteen correct. Two were a little sharp, and one was way flat. The latter took me three adjustments to get right, but in the end all are pretty close. I say close because getting them exact only would be for one style tuning and play so I try to come to a happy medium. I’ll let it rest a few more days and double check several tunings and play to see how it fairs. This one may get a few thin clear coats of shellac.